Ok, I have a confession to make... I love cheesy 50's horror films. They bring back great memories of watching Saturday afternoon Movies as a kid. 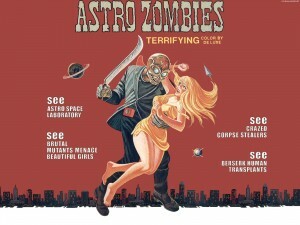 And this Friday at 11:30pm, the good folks at the Mayfair Theatre are making me very happy with a presentation of Astro Zombies. After being fired by the Space Agency, a disgruntled scientist naturally enough turns to creating a superhuman monster from the body parts of murder victims. Yes, that’s a bad idea, but it gets worse, as the beast goes on a murderous rampage. “Directed” in best Ed Wood-style by the helmer of Mission: Killfast and The Corpse Grinders. man, i wish i could have made it out for this one considering i DIDN'T have to work the next morning all of a sudden :) saw a low rating (no surprise) at celluloid cesspool but would adore a review... and i hate reviews. Oh I imagine it was wonderfully, gloriously bad... isn't that the whole point?